The landmarks of Florence are known throughout the world. Let’s explore the extraordinary structures overlooking the river by taking part with your own camera to our Florence buildings on the Arno photo tour! All about the FLORENCE BUILDINGS ON THE ARNO PHOTO TOUR. The navigation via inland waterways is an ancient transport system considered in past time particularly useful for its security. Many of the major cities around the world developed along the shores of rivers: Paris, London, Rome, Vienna... and Florence too. Up to the end of the XIX century the Arno river was a lively center: being highly navigable it was an important commercial route through the Tuscan region, and it was also used to fed some mills built on its shores. This waterway has always be considered important for the city, and along its banks were built stunning buildings, which shapes and colors still fascinates on present days. Even though Florence isn't a capital city, in the past it had enormous importance and developed a lot, becoming in the Middle Ages one of the wealthiest cities in Europe. Cradle of the Renaissance and capital of the Kingdom of Italy, the main ruling family was the Medici. In more recent times it has been declared a World Heritage Site by UNESCO and thanks to its characteristics, like its artistic and architectural heritage, it is considered one of the most beautiful cities in the World. Come with us and discover the blend of water and architecture that marks the city. Take your camera and enjoy the route our insider photographer recommend, and heed to the many tips and tricks our professional could give you while you shoot with your own camera. Experiment the many possibilities the city offers you to capture the best pictures you can, taking advantage of the river, its movements and reflections. Appreciate the city from a different view and walk along the shores of the river to discover details and aspects of some splendid buildings that recall the rich past of Florence. The only bridge survived to the German attacks during the second World War is now a day one of the symbols of the city. 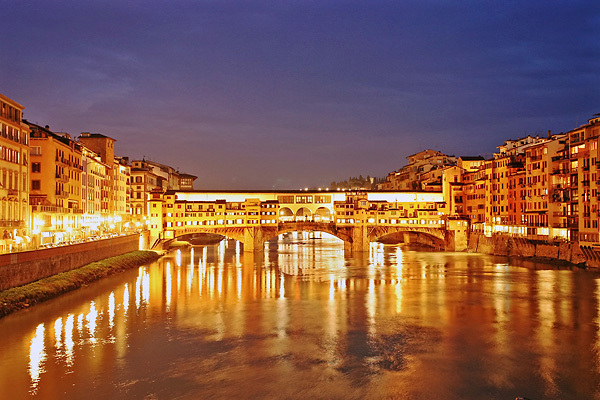 With its three arches the bridge crosses the Arno river in its narrower point. Built between X and XI centuries, the church realized in Romanesque style was spared by the bombing of the city during the second world conflict, but experienced several damages in 1966 during the flooding of the Arno River. Belonging to the XVII century the building hosts today a high school and a peaceful garden enriched with columns and statues. Built in XVI century, beside its importance, the building is highly admirable for the patterns of the façade that portray emblems and grotesque figures. Rebuilt after the floods of the Arno River and the destruction by the German troops, the bridge is considered by many as one of the most interesting and admirable in Europe. It's elegance is also due to the presence of 4 statues representing the seasons and realized to celebrate the wedding between Cosimo II de' Medici and Maria Magdalena of Austria. This Gothic building is one of the most interesting example of medieval architecture in the city. It was used in the XIX century to state the offices of the Comune of Florence. Since 1938 it hosts the fashion house Salvatore Ferragamo, one of the most renowned names of the made in Italy, housing also a dedicated museum. Built in XVII century, the building has a peculiar U-shape that let it obtain the maximum view from the river. The private building attracts several tourist and photo lovers for the its monumental structure and decoration. Crossing this ancient bridge will allow you to reach the old dock named Pescaia di Santa Rosa. Here some fishing lovers meet to catch something, while relaxing on the shores of the calm river and observing the sun reflecting on it. The three-floors building has five big gates towards the square and interesting graffiti on its façade. What is more, it has peculiar front appearing on Borgo d'Ognissanti. 2454637686_585ca6c618_b_cc_flickr_Christopher John SSF Palazzo Corsini on the Arno river, Florence. BIF_Lanfredini_Library_cc_en.wikipedia.org Palazzo Lanfredini and reflections on the river, Florence. 23489015593_1e24e28973_b_cc_flickr_revolweb Ponte vecchio at twilight, Florence. arno-river-965565_960_720_cc_pixabay Landscape photography of the Arno river at twilight, Florence.